I recently shared with you the events from the The Lion King panel that I attended at D23 Expo earlier this summer. This was such a fantastic session which was held in celebration of the fact that The Lion King will be joining the Walt Disney Signature Collection and is NOW available on Blu-ray™ to be added to your collection.This is only the fifth movie to join the Walt Disney Signature Collection, and of course, it also happens to be one of the all time most treasured Disney movies. Obviously this is a Disney classic and one that is so dear to the hearts of Disney fans. Sometimes people ask my why these collections are released and what value they have, especially if they already own the movie. The reason that we love these collections, especially the Walt Disney Signature collections, is because they offer amazing bonus features. If you haven’t ever taken the time to watch Disney movie bonus features then I highly recommend that you start. They are truly one of my favorite parts about these movies and this collection features an amazing amount of bonus material! 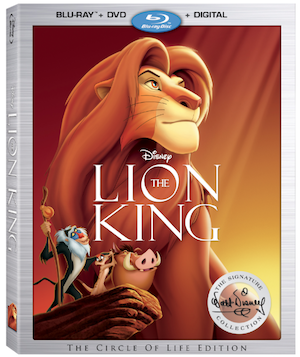 The Lion King Walt Disney Signature Collection is available NOW on Digital and on Blu-ray™!